I'm very excited with my most recent design! A few nights ago I was channel surfing and Nick and Night was playing Rugrats in Paris. 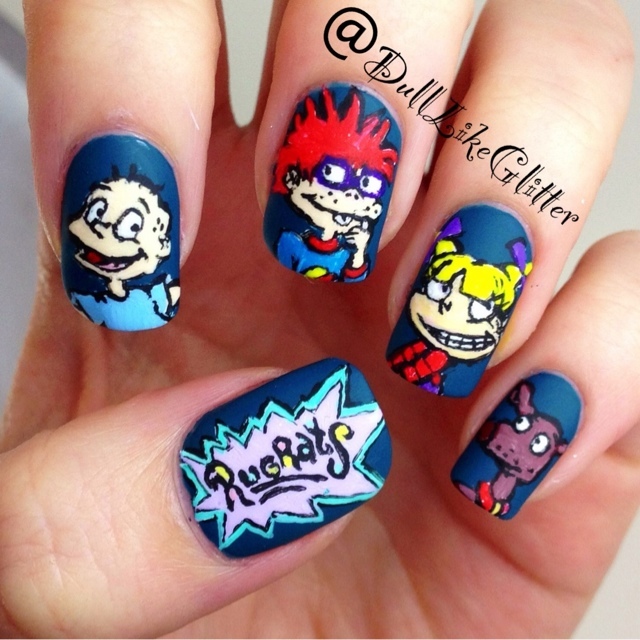 I was born in the 80's and I was a 90's kid so I love the Rugrats! I decided to do a design featured off the show. I'll show you a bit of my artistic process here. I started with a base coat of Julep Donna, a deep teal color creme. It matched the blueish colored rug in the opening scene of the show. After Donna was dry I dipped into my paints and painted white outlines to my figures. The white base will make the detail colors show up bright and more accurate. I went with the Rugrats design on my thumb, Tommy on my pointer, Chuckie on my middle, Angelica on my ring and Spike on my pinky. After layering the white I went over with the largest colors used in each character. The rugrats were skintone, hair and shirt color, spike was brown for fur and the logo was a light purple. I went through and added my black outlines then filled in the little details and colors there. In a few places I had to go back through and touch up any little error or out of place colors. And voila! Only two and a half hours and I'm done. 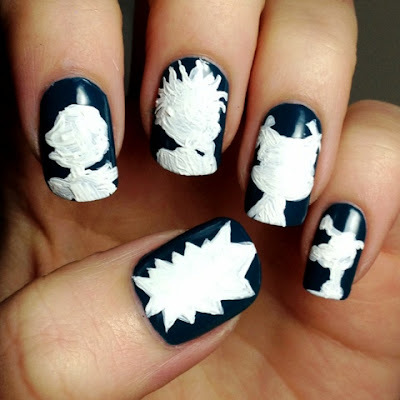 I finished up with Butter Londons Matte Top Coat to make the design look more 2-D and cartoon-y. thats funny! :) the same exact thing happened to me. surfing the channels i found it on too!! lol didnt do nail art and glad bc yours turned out amazing!!! great job :D this was my all time favorite show as a child, it would come on as soon as i got home from school, may explain why i never did home work haha..